Wow! What a weekend! Saturday night, October 29th, that’s October, not December, we had our first winter storm, a pre-Halloween storm. We had a little dusting on Thursday night, but that was nothing. We only got 4 inches, but, oh the destruction this early storm wrought. Last night, we heard a loud crack. We looked outside to see a large branch broken off a neighbor’s tree and blocking our road, a major thoroughfare. The plows did a creative dance and pushed the limb to the sidewalk, but it’s a lot of wood for someone to clean up. Personally, we sustained minimal damage. We had some branches down in the front and back yards. Initially, I thought I lost my beloved magnolia out front, but I shook the snow weighting down the limbs, and as the sun melted the rest during the day, the tree resumed its upright stance. There is some damage, but fortunately not a total loss. We made it through the night with power. There were a few flickers overnight. Around 6 am, the power went out for good. No power, no heat, and eventually, no phone. At least, it was a sunny day. We went for a morning stroll to check out the surrounding neighborhoods. Lots of trees were down, blocking roads, leaning on wires. Power outages were the norm, though some streets were unaffected. Lots of people were outside, cleaning up the debris, and commiserating about the early storm. My heart goes out to neighbors that I’d never met before who live about ten houses down from me. 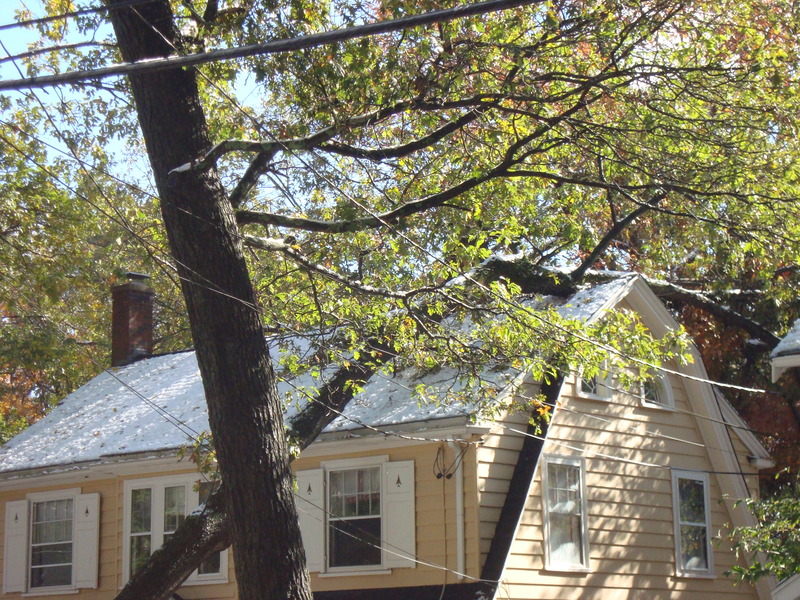 A 75-foot oak tree was leaning on their house, where it had broken through the roof. 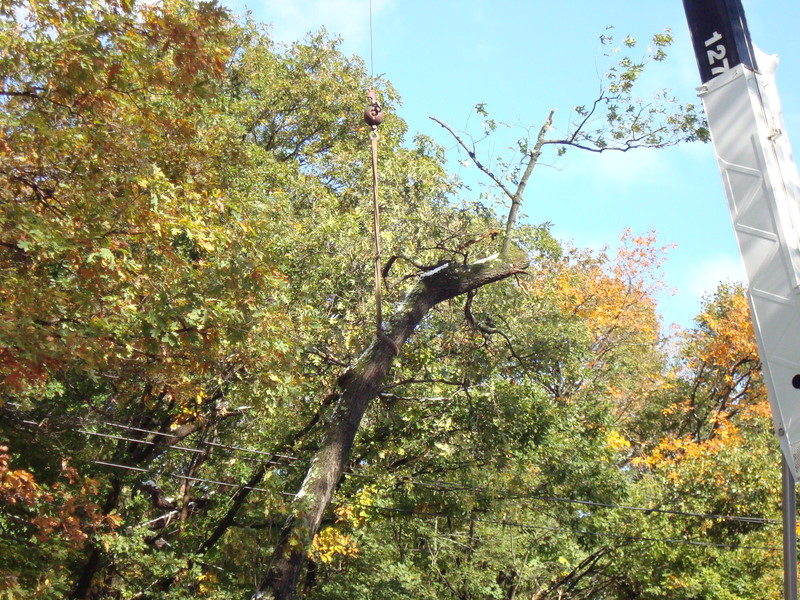 An amazing show followed about an hour later when the tree service showed up with a 120+ foot crane and actually lifted the tree into the air, over the power lines, to lay it on the main road to cut up and run though the chipper. I was nervous watching the tree dangle high up in the air. I can’t imagine how the homeowners were feeling. Per town recommendations, we were trying to “avoid unnecessary travel”. It was interesting to discover all the things you can’t do when you have an unexpected, powerless, day at home. You can’t really cook when you’re also trying not to open the refrigerator. Even so, you’re restricted to the gas cooktop, manually lit. No baking because the oven’s electric. You can’t do much in the way of housecleaning, because you can’t vacuum. You can’t do laundry. You can do self-contained work on the laptop, as long as you don’t need the internet because the wireless is out, and the battery is charged. You can’t surf the web for the same reason. You can go for walks (avoiding streets with downed wires) and chat with neighbors. You can read, during daylight hours, and there’s never a shortage of books here. You can also work on low-tech craft projects like knitting, again never a shortage of in-progress projects either. We were quite lucky, and our power was restored around dinnertime. Spending a single day without electricity and the other “necessities” it supplies was not a real hardship. It really made me think about how fragile our dependence on the manmade world really is. Unfortunately, many of our neighbors had to wait longer. The neighborhood behind us didn’t get power until one night later. Other friends still don’t have power more than three days after the storm. Halloween was postponed until next weekend. Fortunately, I made some pre-storm beef stew which was a wonderful, hearty meal. This was different from a typical beef stew. 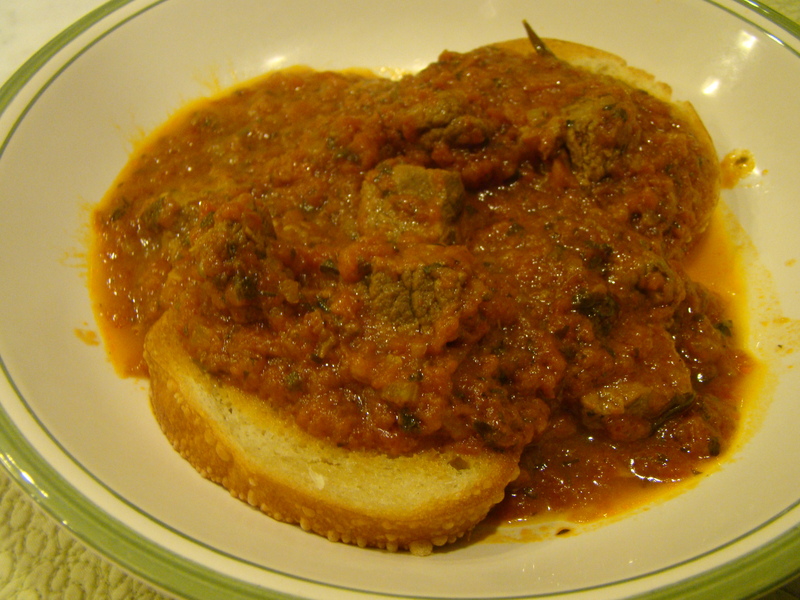 First, I made a chunky tomato sauce, then simmered browed beef in the sauce until tender. The recipe called for serving the stew over garlic toasts, which I did. I served leftovers over egg noodles, which I preferred. The recipe serves 4, but they aren’t generous portions for most eaters. If you’re making for hearty eaters, you might need to double it. 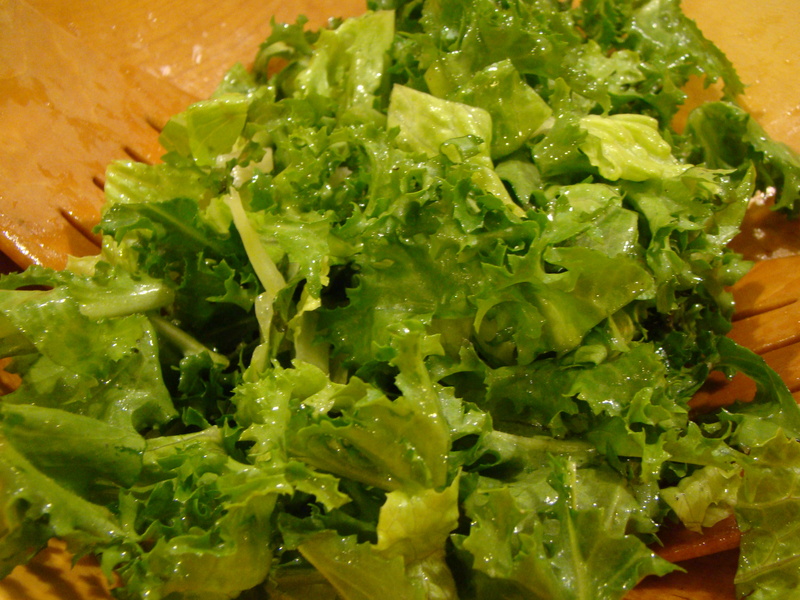 A bitter salad, with a mix of chicory and romaine tossed with garlicky-anchovy dressing, was the perfect accompaniment. Trim the meat of any fat and cut it into 1-inch cubes. Set aside. Drain the tomatoes (reserve 1 cup of juice). Coarsely chop the tomatoes. Combine the chopped tomatoes, reserved juice, celery, parsley, oregano, thyme, olive oil, salt and pepper in a Dutch oven, cover, and bring to a boil. Reduce the heat, and simmer for 30 to 40 minutes, until vegetables are tender. Put the sauce through a food mill (I used the blade with the largest holes) and set aside. Clean the pan. Melt the butter in the Dutch oven over medium-high heat. Add the beef, and cook, stirring, until the meat is browned (do in batches, if needed). Lower the heat to medium, and stir in the garlic. Transfer the meat to another dish. Add the wine to the Dutch oven, and boil over high heat until reduced by half. Add the meat, rosemary sprig, and tomato sauce back to the pan. Taste, and adjust seasonings, if needed. Cover and simmer until the meat is very tender, 1½ to 2 hours. Taste again and adjust seasonings. With mortar and pestle, mash anchovies and garlic to a creamy, smooth paste. Whisk in vinegar. Then, slowly whisk in the olive oil until emulsified. Season with salt and pepper to taste. Tear chicory and romaine into 1-inch pieces. Toss the greens with enough dressing to coat. You might not use it all.